Ruth is a great book of the Bible for kids to read. It’s written as a story, it’s short, and it has great lessons like humility, loyalty, faithfulness, and working hard. 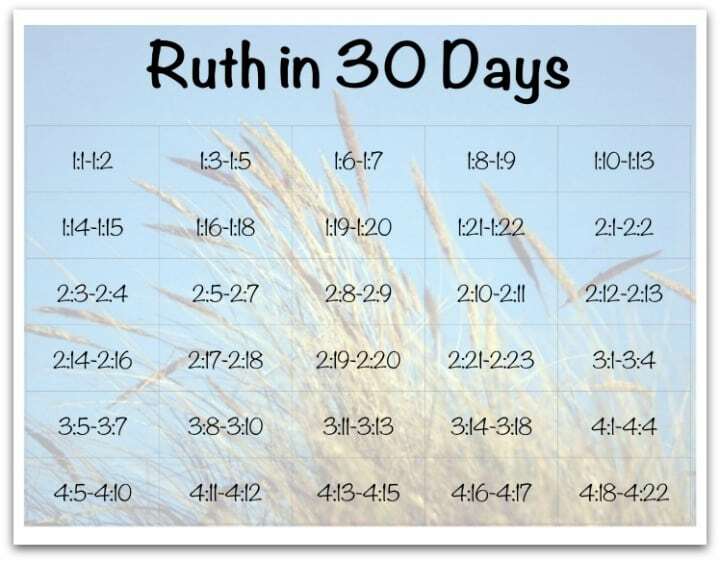 I put this chart together to have my children, at home as well as at church, work through the book of Ruth. They can read just a few verses a day, mark off what they read, and soon they will have read the entire book. Click on the preview above to download the printable PDF of this chart. It’s a short book with only 4 chapters and it reads like a story so it will keep their attention. It’s also about a woman of great faith, which will appeal to the girls in my classes. But, I think Ruth crosses the “gender divide” and appeals to boys as well. She is a hard working faithful woman who becomes the great grandmother to King David! This is a wonderful activity for kids who are home on summer break, or whenever you need some structure for family devotional time. It’s a good follow-up to our 30 Day Philippians reading chart. I think the reading is a very good device for helping students stay on track on reading the book of Ruth. We are beginning the book of Ruth in my 9-10 year old girls Sunday School class. Thank you for the guideline. Tony Kummer (Editor) reviewed & updated this page on : June 25, 2015 at 8:43 am. All our content is peer reviewed by our readers, simply leave a comment on any post suggest an update.